SUMMARY: We describe a case of decerebrate rigidity, with preservation of consciousness, caused by a discrete pontine tegmentum lesion identified on MR imaging. Lesions within a certain brain stem region are responsible for decerebrate rigidity in animal studies, but there has been a lack of MR imaging evidence in humans. This report also implies that a discrete lesion was responsible for the decerebrate rigidity, while consciousness was preserved. The term “decerebrate rigidity” (DR) was first used in 1898 by Sherrington to describe posture after an intercollicular transection,1—ie, the lesion between the red nuclei and the vestibular nuclei found in animal studies. Such lesions result in a loss of flexor modification normally supplied by the rubrospinal tracts.2 The extensor reflexes are then exaggerated, leading to a rigid extension of the limbs accompanied by hyper-reflexia and opisthotonus. Although DR is familiar to most neurologists, it is usually associated with consciousness disturbance and severe motor dysfunction.3 So far, there has been no evidence from human studies to prove a discrete lesion at the same level as in the animal findings of Sherrington,1 along with preserved consciousness with brain stem lesions found on MR imaging. 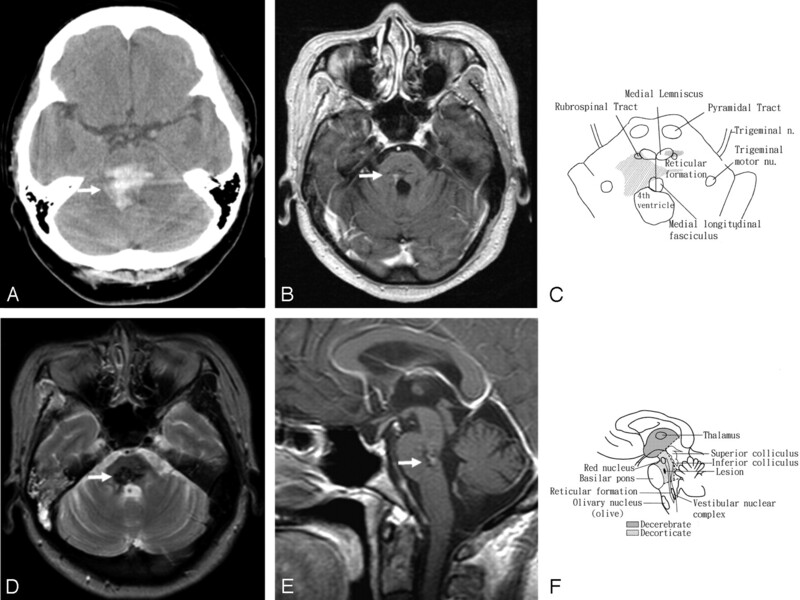 We report the case of a DR patient with a preservation of consciousness. A 48-year-old woman was admitted to our hospital because of a sudden change of consciousness. Beside 2 small low-signal-intensity densities in the basal ganglia, the brain CT showed a rostral pontine hemorrhage with a fourth ventricle extension (Fig 1A). She had mild hypertension, but without a history of stroke. We believed that hemorrhage of the brain stem was the major cause of her loss of consciousness and another 2 small lesions were old, silent strokes. The Glasgow Coma Scale score on admission was 4; the best motor response was 2 (DR posture); the best verbal response was 1 (no response); and the eye-opening response was 1 (no response). Neurologic examination revealed a normal light reflex, an absence of right-eye corneal reflex, and an oculocephalic reflex. A mechanical ventilator was used to support her respiration. Extension of her 4 limbs with internal rotation of bilateral arms and plantar flexion, clenching of the jaws, and opisthotonus had been noted since admission, and these findings were amplified by pain or pressure stimulation on her limbs. She regained consciousness 5 days after the stroke onset and was able to follow simple instructions (such as opening and closing her eyes). Limb movement was limited, and she could only move the right upper limb slightly. Motor-evoked potentials to transcranial magnetic stimulation 1 week after she regained consciousness showed preserved corticospinal tract responses, though the onset latencies were delayed and the peak amplitudes were decreased. A, Noncontrast CT of a 48-year-old woman who presented with DR and preservation of consciousness shows a right rostral pontine tegmental hemorrhage (arrow) with an extension into the fourth ventricle. B, T1-weighted axial contrast MR image 3 months after the stroke shows a sequela of the prior insult in the right pontine tegmentum (arrow). C, Schematic drawing of the brain stem illustrates the lesion and its surrounding structures in an axial view (compared with panel B). D, T2-weighted axial MR image shows the sequela of old insult in the right pontine tegmentum (arrow). E, T1-weighted sagittal contrast MR image shows the abnormality in the right rostral pontine tegmentum (arrow). F, Schematic drawing illustrates the sequela lesion and its surrounding structures in a sagittal view (compared with panel E). Three months later, there were residual neurologic deficits with right abducens palsy, right facial and crossed left hemibody sensory impairment, poor hand dexterities, and truncal unsteadiness. She was able to follow commands to execute simple tasks, such as moving her shoulders and flexing and extending her wrists or elbows. She could not perform some tasks, such as by using her hands to write or to eat with chopsticks, a fork, or a spoon. She could not maintain a steady sitting position without support or maintain an upright posture even with support. Because the daily record of blood pressure did not show any evidence of hypertension, she did not receive antihypertensive medications after discharge. MR imaging of the brain was performed 3 months after onset. It revealed a discrete sequela of old insult in right pontine tegmentum (Fig 1B, -D, -E ) and a tiny low-signal-intensity abnormality on both T1-weighted and T2-weighted images in the left thalamus. There was no evidence of any other vascular malformation. The muscle response to transcranial magnetic stimulation became larger along with improvement of her muscle strength, though her muscle tone was hypotonic. She remained in flaccid paralysis and did not show significant improvement in motor function on the series of 6-month and 1-year follow-up examinations. DR shows a typical pattern of classic gamma rigidity with the arms in extension, adduction, and hyperpronation and with the feet in extension and plantar flexion. A state of hypertonus in the postural muscles occurred when the brain stems of cats were transected at the intercollicular level.1 The term “decerebrate rigidity” was applied to this condition because it also occurred after removal of the cerebral hemispheres. A series of animal studies revealed that loss of integrity of the reticular, cerebellar, vestibular, and cortical descending neural systems was responsible for the development of DR.4 The rostral pontine tegmental lesion between the red nuclei and vestibular nuclei disrupted the rubrospinal effect on the facilitation of flexor movements in the contralateral upper limbs2 and exaggerated the extensor effect by the removal of the central (cortical) inhibition on pontine reticular formation (medial reticulospinal tract) and Dieter’s nucleus (lateral vestibulospinal tract), the 2 centers of an excitatory influence on extensor muscles5 (Fig 1C, -F). Imaging studies have been reported in DR patients with preserved consciousness because of ischemic hemispheric damage without a brain stem lesion.6, 7 In Damasceno’s study,7 DR was noted only in the upper limbs, differing from our patient, who had involvement of the 4 limbs, as in Sherrington’s report.1 The case of Damasceno provided another mechanism that a conscious patient with DR might result from a supratentorial lesion affecting the corticoreticular neurons instead of the brain stem involvement of the critical structures mentioned above.7 In contrast with their cases,6, 7 lesions of brain stem were identified by pathologic studies8 and MR imaging in our case. These findings have shown that the mechanism of DR was mainly due to a lesion involving vestibulospinal and rubrospinal pathways and did not arise from the destruction of the corticospinal pathway, as found in animal studies.